Smelling Sunshine is a story that creates a path through various cultures by describing one world doing an ordinary chore of hanging laundry that becomes extraordinary in its personal nighttime comfort. The large-format 8x10 inch pages, show off the lovely illustrations perfectly. The text is simple, and non-rhyming, with poetical touches. We tend to think of ourselves, our lives, as separate from others. I wanted to show a connection among people from diverse backgrounds. 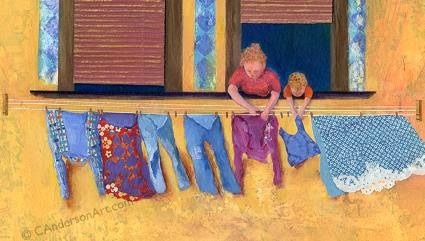 Hanging laundry with someone you love is a simple, shared task everywhere. Compassionate understanding can start with something this elemental. Why did I request a review copy of this book for my blog, Italophile Book Reviews? 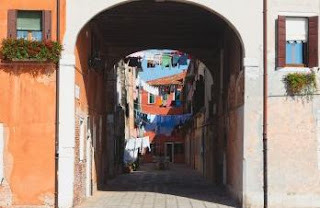 Because I am always amazed when I see people photographing drying laundry in Italy, strung over streets, or hanging from racks off balconies sometime even covered by pieces of plastic to protect it from the rain. Hundreds, actually, probably thousands of photographs of Italian families' private apparel can be found in tourists' albums after they return home! the smell of bedding that has dried outside on a line. 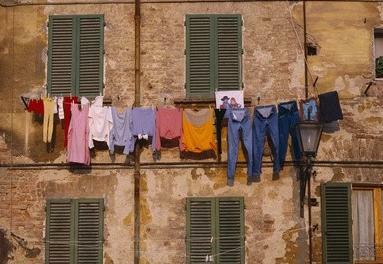 In Italy, electricity is very expensive, so not all families have electric dryers, and those who do, take advantage of good weather to same money. When the weather is nice, I hang the laundry outside, despite having a dryer, because I love that smell of sunshine and plants the clothes get. They smell so much nicer after line-drying when they come out of an electric dryer. I wonder if people use those scented dryer sheets understand what they are supposedly replacing? I suspect that in many wealthy, hyped-up countries, the custom of hanging wash on a line to dry is very quickly dying out. For now the book is available only in English, but I hope it will become available in other languages, for just that reason. A collective memory around the world of clothes drying on a line may not be a worldwide collective memory for much longer! One point, however, that struck me is illustrated by a line from the book "Mommy and me". All the adults drawn in the book are women. While around the world, washing clothes is usually done by women, it would have been nice to include a man hanging the wash in one of the images that depicts one of the less macho societies in the world, where men help with the household chores. 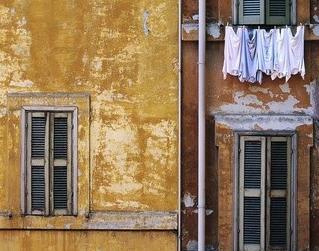 All around the world in cities, towns, and villages—large and small—clothes are washed. 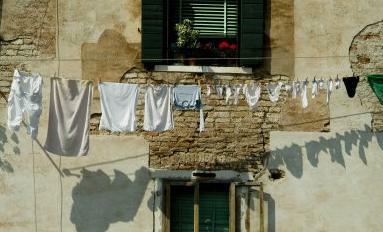 They are hung to dry in the breeze and sunshine, and children everywhere revel in the fun of helping with the laundry. 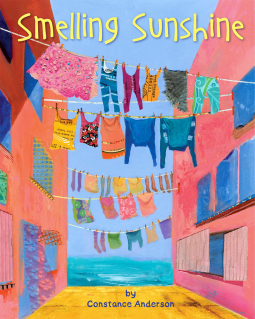 Smelling Sunshine captures some of the special moments of this day-to-day chore—a wonderful, heart-warming time shared between parent and child and an experience young readers will relate to. We believe that all children should see themselves in print and we make a concerted effort to include children of all colors, nationalities, and abilities in our books. In addition to seeing themselves, children should also hear familiar language in the books they choose. In pursuit of that goal, we publish engaging books in twenty languages. Direct link to the book's page at the publisher's website. I can't resist leaving you with just one more image of Italian laundry, this time in Venice.